Isaac started his second year of preschool this week. He has the same teacher Lily had, so we are expecting a great year. There is only one boy from his class last year in the room, so he will need to make some new friends. I anticipate this won’t be too hard for him. Nancy is visiting for the week. She is on one of her east coast visiting tours, where she started in Boston with Jonathan, is now with us in Virginia, and takes the bus tomorrow to NY to spend time with Annie. On this trip she has a travel companion, David Rossi, who arrived last night for a short visit before he continues on to NY. He hasn’t been here in a few years and hasn’t seen Lily and Isaac in over a year, so we are all enjoying his company. I came home from work last night not feeling well and woke up this morning with a cough, headache, and overall body aches. It seems unfair that I am sick before my children this year. I actually stayed home from work today in hopes I could rest and stop whatever this is from getting any worse. I am keeping my fingers crossed it doesn’t spread through the house. Lily has her first spelling test tomorrow. I know Nancy has been working on the words with her all week, so let’s hope she has Aunt Karen’s genes for spelling and not mine. Lily also has quite a bit of homework each night – words, writing, math, and reading. It is all supposed to take around 30 minutes, but it is quite a lot to organize and manage. The cadence of the homework stays the same all year, so I am sure we will get into a rhythm as time goes on. Isaac was not a happy model on his first day of school so it was difficult to capture a picture. Here he is in action – it was the best I could do. 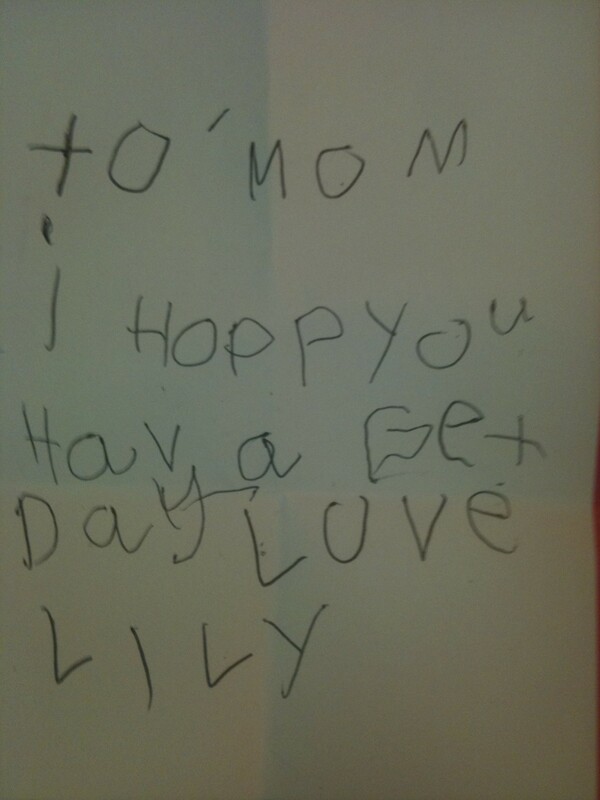 Ben and I sometimes leave Lily a note in her lunch bag. This morning she made my lunch and left me the following note. It has been almost 6 months since I wrote an update and too much has happened to try and document the missed time, so I guess I’ll just pick up from today. Lily has started first grade and seems to be enjoying the full day at school. Isaac and I take her to the bus stop at 7:25am and she confidently gets on the bus, but before she walks up the steps she always gives Isaac a good-bye kiss and hug. 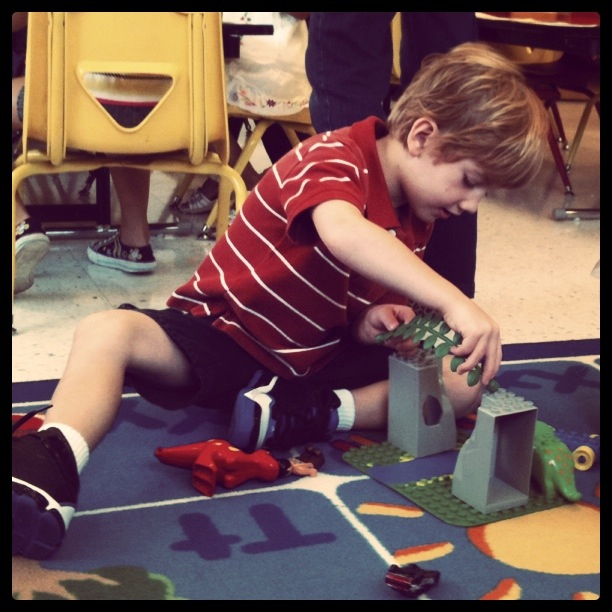 Isaac’s preschool doesn’t start until next week, so he has one more week of long summer days. He is using this time to become an even more skilled bike rider (he now does tricks and quickly conquers things older kids work hard to accomplish). His next sport to explore is Soccer, and he is looking forward to the first practice on Saturday. I received a late birthday present today from Ben and the kids – a skateboard. Around my birthday I decided I wanted to try and skateboard. I love my scooter and rollerblading so it seems I should also enjoy skateboarding. The only thing is it slightly scares me, which is another reason I decided I should try it. It has been a long time since I have tried to learn something like that, and it should be an interesting learning experiment. Typical to my learning style, I didn’t do any reading or video watching before trying to get on the board. I listened to a few instructions from Ben (and from Isaac who already thinks he is an expert) and did manage to get on the board and could ride around the court. I must say it was quite fun and I am looking forward to my time out in the court with the kids. I guess if I need to be outside watching them anyway, I should have some fun too. Oh, and in case anyone is concerned about injuries, Ben did get me a helmet also. I also posted a few pictures from the end of Summer in our gallery.